Baracuda T5 Duo - Automatic Suction-side Inground Pool Cleaner Made By Zodiac. 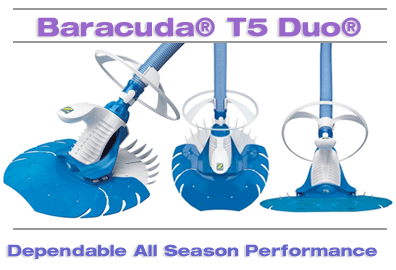 The Baracuda T5 Duo is a disc-style suction-side pool cleaner that features Baracuda's one moving part technology and patented Dura-Life™ Diaphragm for maximum durability and quiet operation. The cleaner delivers maximum cleaning coverage with two independent discs for greater pool adhesion and flexibility, while the adjustable wheel deflector enables fluid navigation around corners, steps and ladders. It is engineered to allow unimpaired cleaning over lights, main drains and wall fittings that may hang up other cleaners. Product Manufacturer: Zodiac Pool Care, Inc. Delivery Information: Please allow 2 to 5 business days for orders to be processed, plus standard transportation delivery time.